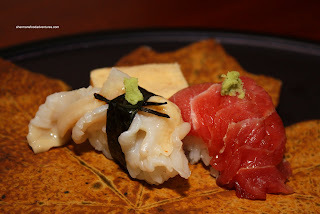 Omakase, a Japanese tasting menu of sorts, is quite the experience. Other than taking into account certain dietary restrictions or allergies, anything goes. The menu is left up to the chef and you merely go along for the ride. Most often, you are looking at $100.00 per person for the good stuff. Now, one of the first places that come to mind in the GVRD is Tojo's. And why not? He has received a lot of fan fare for his cuisine on TV, internet and print media. However, whenever there is hype, there comes a price. 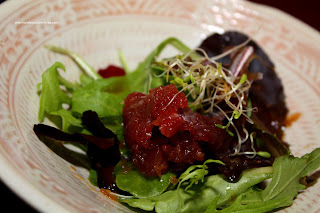 Recently, Pomegranate and I went all out for the "no limit" Omakase at Tojo's. That means sitting at the sushi bar with Tojo hims elf supervising and making many of the courses. Basically, we kept eating until we told him to stop. At that point, we had already spent almost $500.00 between the two of us for food, sake, taxes and tip (around $350 on food alone). Was it worth it? Well, that really depends on the point of view. In terms of value, of course not. But if someone wanted to buy a Ferrari, are they looking for value? That would be the same with Tojo's. 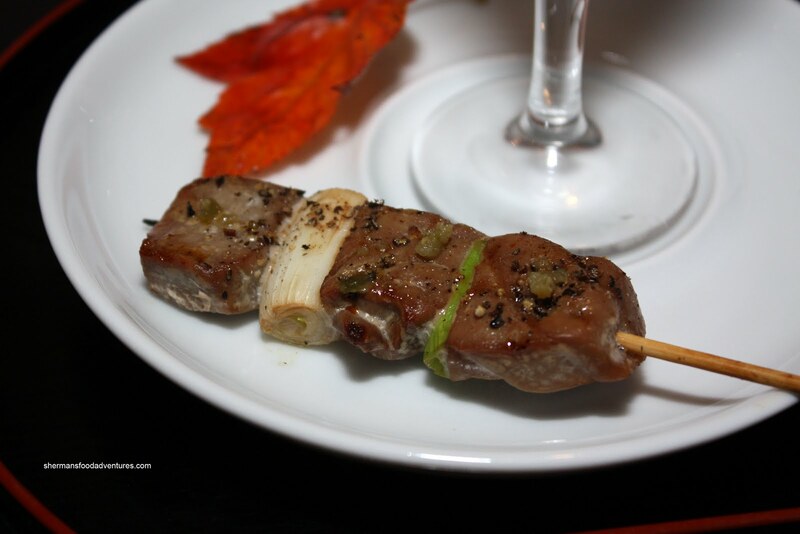 It's for the experience and the right to say you've eaten at Tojo's. Now, there are those who would like to point out that a true Omakase experience which will cost you much less can be found at Octopus' Garden. Completely the antithesis of Tojo's, Octopus' Garden is a small place run by sushi chef Sada-san. He is a humble man who is both skilled and creative. He will greet you with a friendly smile and make you laugh with his honest humour. There is no pretentiousness and certainly no arrogance. The food does the talking here, not the hype. While we were dining at Tojo's, Pomegranate and I had already planned to do the Omakase at Octopus' Garden as a comparison. Due to circumstanc es beyond our control, it has taken us nearly 4 months to do so. Better late than never I suppose. No longer advertised on the website nor printed on their menu, the Omakase is still very much available. There are two choices: $60.00 and $100.00. Naturally, the more expensive option comes with all the bells and whistles. Of course we went for the bells and whistles! We're men and we like shiny things... Actually, we did start with something relatively shiny in the Oyster on the half shell. Simply presented, the Kumomoto was sweet and fresh. Up next was a Bluefin Tuna Salad. Another simple dish consisting of mesclun greens with a few pieces of beautiful tuna dressed with a light ponzu shoyu. Mixed together, there was a nice balance of salt and acid to accent the natural sweetness of the fish. And about that tuna... The simplicity of the salad allowed the star of the show to shine with its smooth meaty texture. Delicious. Onto one of Sado-san's signature items - The Uni Shooter. 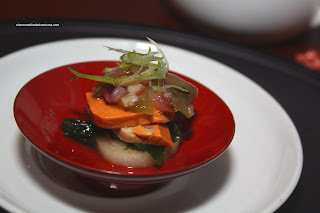 Consisting of mountain yam, rice, quail's egg and uni, this is a very unique offering. 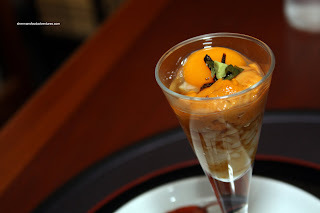 Although the egg and uni share a similar consistency, somehow it all works. Very delicate tasting with natural sweetness from the uni, the mountain yam offers up some much needed crunch as a textural contrast. Served on the side was a Bluefin Tuna Skewer with green onion. Honestly, I didn't care much for this. It's almost a shame that such a beautiful fish would be overcooked on a skewer. Lost is the wonderful meaty texture and rich flavour. Instead, what we got was a hard piece of tuna with salt. A very delicate Matsutake and Geoduck with spinach broth was p resented to us next. 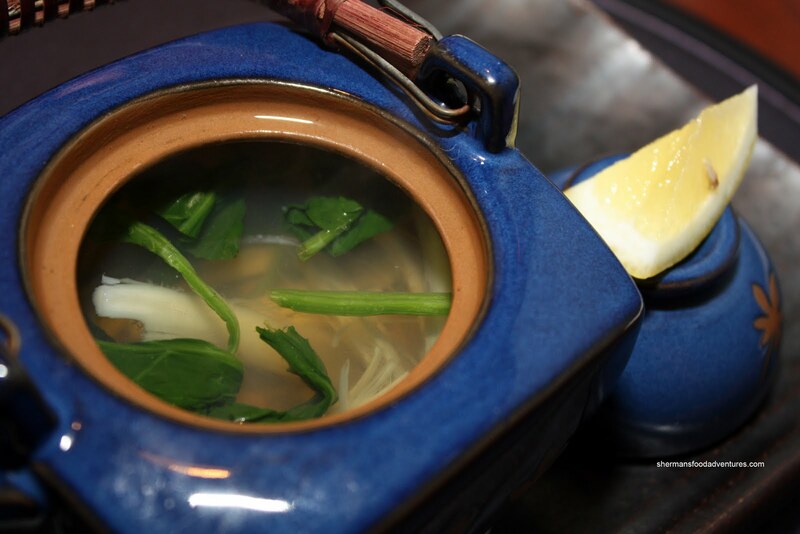 We drank the aromatic broth first with a touch of lemon and then proceed to eat the ingredients. 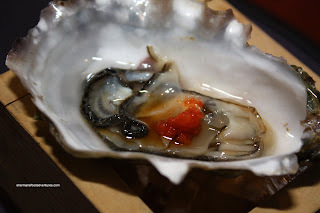 The flavours were very subtle with some sweetness derived from the geoduck and unique aroma from the matsutake. A refreshing interlude before the wow kicked in. That's right, up until this point, we were happy with the meal; but hardly kicked in the gut with flavour nor blown away by anything. That all suddenly changed with the Monkfish Liver with Tako Sashimi. A combination of monkfish liver atop wakame, daikon and topped with tako sashimi resulted in both a texture and flavour revelation in our mouths. There was crunch from the daikon, chewiness from the tako, smooth "foie gras of the sea" from the monkfish liver and umami from the wakame. Outstanding. 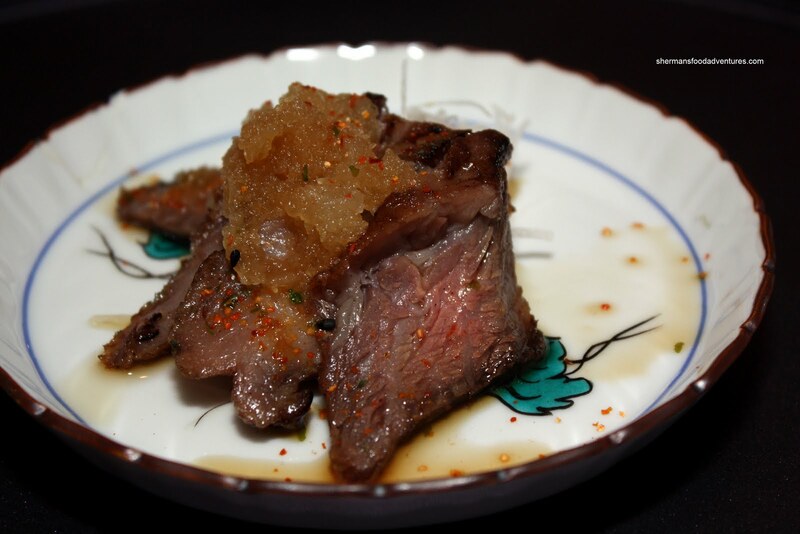 To further kick it up a notch, we were served Wagyu Beef with grated spicy daikon. As you can see, the beef was not completely cooked all the way through. This is significant. Since Wagyu beef is so well-marbled, any instance of rareness will result in some chewiness. Thus, the beef wasn't as tender as one would expect. But, in the end, this did not matter because the high-fat content only r esulted in an abundance of flavour. The spicy grated daikon complimented the delicious beef very well. As we were still licking our lips from the tasty Wagyu Beef, an enormous Sashimi Platter arrived at our table. The "wow" factor x 2. Beautifully arranged with super fresh components, we were chomping at the bit to dig in (after I took photos of course). There was a plate of Albacore Tuna, Tuna Tataki, Amberjack, Mirugai, Wild Salmon and Tako. A whackload of fresh Uni and 2 Spot Prawns. 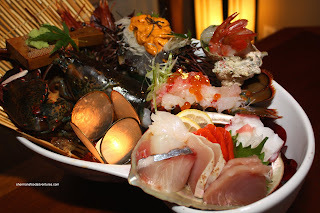 The centrepiece was a whole Lobster with the tail served as sashimi topped with Ikura and edible gold (yes, gold) . What a treat I tell ya. Everything, and I mean everything was fresh and delicious. I needed very little soy and freshly grated wasabi for the sashimi. So naturally sweet. Then a strange dish of sorts arrived next - Braised Red Snapper Head with bean curd skin and Shanghai bak choy. Hey, I love head, er... I mean fish heads... But it really didn't seem to fit within the flow of the meal. With that being said, I liked it - from the gelatinous skin, soft cheek, to the soft belly. The sweet soy braising liquid was a nic e flavouring agent. 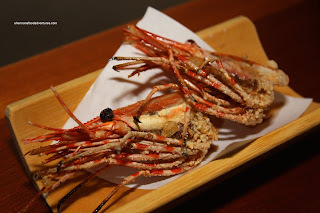 And as if we didn't get enough head already, we got the Fried Spot Prawn Heads. For those who haven't tried this, it is a real treat and not scary at all. Fried until super crunchy, the whole head can be eaten. Only seasoned with some salt, it is almost like a shrimp cracker of sorts. For awhile there, I was worried that I wouldn't get a chance to sample any sushi or nigiri. I was really happy to see the next dish which consisted of 2 pieces of Nigiri, one geoduck and one bluefin toro (with a piece of tamago). Once again, simple; yet delicious. The geoduck was sweet and had a nice crunch while the bluefin toro was nice and fatty. The sushi rice was nearly flawless with a nice chew while not being too dry. Vinegar and sweetness was easily apparent as well. 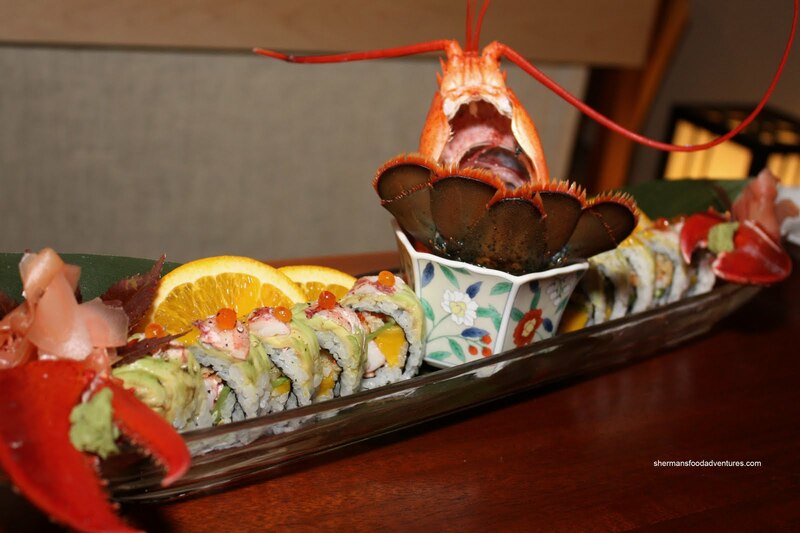 As if we could actually eat any more food, we were surprised to see the Mango Lobster Roll (or Lobster on Vacation according to Sado-san). A balanced combination of lobster, mango, snow pea, tempura bits, tobiko, avocado, nori and ikura, this roll was very good. Different textures and flavours really made this roll interesting to eat. The sweet mango finish left a pleasant aftertaste. By now, we were so full, it was not funny. I really couldn't eat anymore. In fact, I was too full to eat prior to the lobster roll. Hence, when we were offered a choice of desserts - either to have the small or large - we chose small... until we asked what they were. 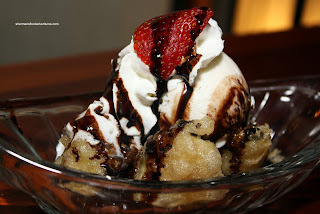 The small was only ice cream, while the large was Fried Banana with ice cream. Pomegranate and I immediately changed our minds and went for the large dessert even though we could not eat another bite. It turned out to be a good choice since the tempura fried banana was yummy. Perfectly fried crunchy tempura gave way to sweet soft banana. Topped with ice cream, whipped cream, chocolate sauce and a strawberry, we scoffed it down like you would think we were still hungry. OMFG. What an outstanding meal. We got twice the amount of food for nearly half the price we paid at Tojo's. Of course, Tojo's and Octopus' Garden are not really all that alike in many ways; but the bottom line is that the omakase here is both superior and less expensive. The quality and selection of ingredients was fabulous. Think of it: Wagyu beef, monkfish liver, bluefin tuna (and lots of it), geoduck, lobster, uni, spot prawns and the list goes on. I would not hesitate to say that the $100.00 represents a very good value. Take into account that there is no pretentiousness, hype, and unrealistic expectations at Octopus' Garden compared to Tojo's, there is absolutely no contest as to which one has a better Omakase. But in the end, if you have money to burn and people to impress, then Tojo's it is. However, I would gladly do the omakase at Octopus' Garden again because it is awesome and the fact I can actually justify spending the money on it. I can't believe you got all that food for $100!!?!? Lobster in itself is already $100! I really like this post on your comparison between Tojo and Octopus Garden...it just goes to show that just because if Tojo is not affordable for everyone there is someone else out there that can provide just as good value at affordable prices. 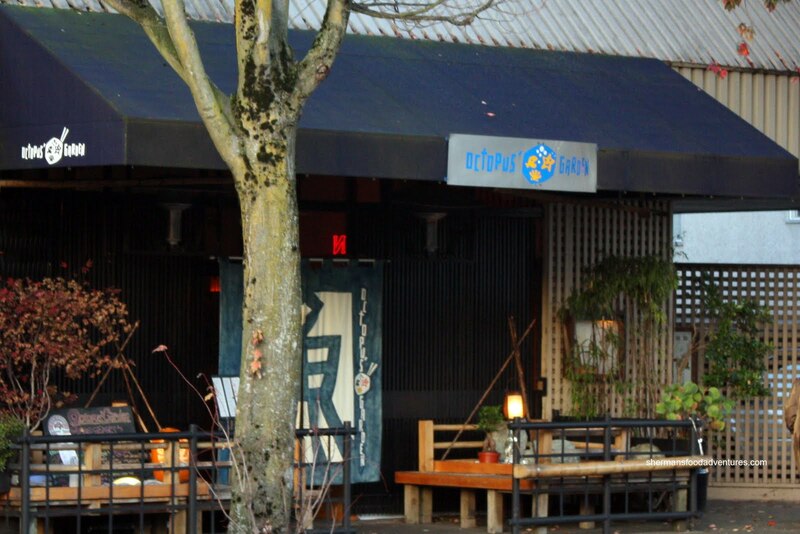 Sherman, I definitely agree with you that the omakase is much better at Octopus Garden, plus it's more friendly and intimate, and in my opinion the service is much, much better than Tojo's. It's really no contest when you compare the two in my eyes! Plus, Sado-san is such a great chef and super nice guy! I'd rather go to Octopus Garden than Tojo's. Tojo's is rather overrated based on what I've heard from a sake supplier to most of the Japanese restaurants. Mmmm...everything looks so tasty! Do you have to call ahead for the omakase to let them know that's what you want? agingteen, yah it's $100 per person. Sounds like a lot, but for the quality and amount of food, it is absolutely worth it. nina, my mouth is watering too, I need to go back! Victoria, absolutely. Tojo's is excess and not really a necessity unless you have money to burn. Anita, Tojo's is overrated; but as I said, people don't go to Tojo's for value. 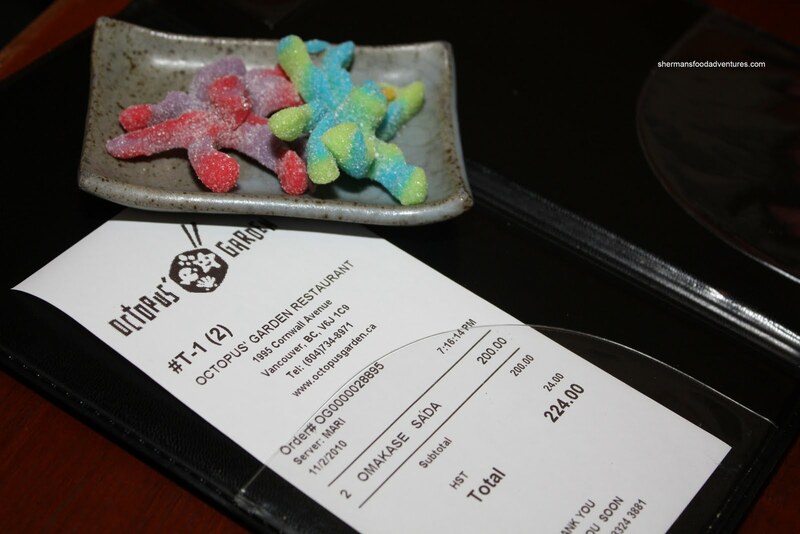 With that being said, I'd take Octopus' Garden even if it did cost as much as Tojo's. Gigi, I did tell them in advance. Not sure if you had to though. jealous! I've been wanting to eat here for years! Don't think I can eat that much food. I gotta wonder how your stomach keeps up??? Also, I'm a frequent reader of your blog... keep up the great work! Ryan, you are right, Tojo is very much happy with himself... We got the same thing. Degan, just do it, you won't regret it. Anson, I'm not sure, but it does. Leanne, it's actually on closed on Wednesdays only until Spring, not to worry! 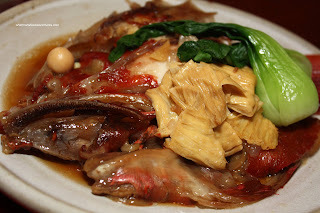 Yay, another food blogger agrees Octopus Garden is better than Tojo. I have been going to Octopus Garden for approximately 5 years. Sada-san never disappoint. I will like to add that Sada-san's menu change according to season as well as the freshness of food. Do attempt to go once in winter and once in summer to see the expression of seasons. Also, the hallway by the washroom has a lot of fun things to look at -- toys, octopus related items, and pictures.